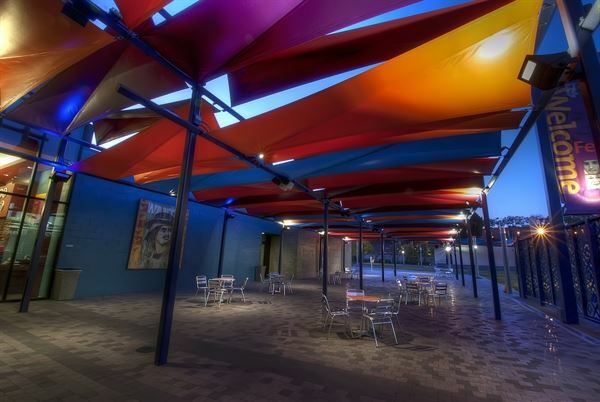 LA Plaza de Cultura y Artes offers a beautiful campus suitable for both indoor and outdoor events of all types. The 2.2 acre facility is comprised of two historic and newly renovated buildings - the Vickrey-Brunswig Building (c. 1888) and Plaza House (c. 1883) - surrounded by 30,000 square feet of gardens, lawn, patio and outdoor stage. Located near the site where Los Angeles was founded in 1781, guests are given the unique opportunity to explore and contribute to the ever-evolving story of Mexican and Mexican American culture in Los Angeles just steps from where it all began. LA Plaza Special Events strive to introduce new audiences to the campus and exhibitions and invites them to share in its mission to celebrate and cultivate an appreciation of Mexican and Mexican American culture. Because of this, the event program may include the opportunity for guests to tour the first floor galleries and Calle Principal. Campus: Patio, Lawn, and Stage: $8,000 / Day Patio: $3,000 / Day Walkway $3,000 / Day Conference Rooms $100 / hr. Calle Principal 75-150 $1,000 / Day Fees are determined by the size of the space requested, length of the event, the number of guests and the time. Additional audio visual equipment and furniture are available for rent.